Running a website that sells kinesiology tape and writing a kinesiology taping blog keeps me up to date on taping terminology. With all of the brand names, generic terms and even mis- spellings, it can be difficult to keep all of today’s “kinesio” terms straight. Whether you’re a newcomer or a seasoned kinesiology taping professional, you should find the following kinesio glossary useful. Kinesiology Tape is a generic term for a thin, stretchy therapeutic tape that comes in assorted sizes, colors and configurations. Best known as an athletic tape or sports injury tape, it is also widely used in medical and rehabilitation settings such as physical therapy clinics, chiropractic practices and hospitals. There are currently 4 major manufacturers offering quality kinesiology taping products both domestically and internationally. They are Kinesio® Tape , KT Tape™, RockTape and SpiderTech™ Tape. Rolls of kinesiology tape come in assorted lengths and widths. The most common size is the 2″ x 16′ single roll, which all of the major kinesiology tape brands offer. Several manufacturers also offer bulk rolls rolls that are 2″ wide and 105′ (Kinesio Tape, RockTape) or 125′ long (KT Tape).RockTape also offers 4″ wide rolls in both single and bulk roll sizes. KT Tape offers rolls of tear-off, precut strips in 5″, 10″ and 18″ strip lengths. The 5″ and 10″ strips are perforated longitudinally, allowing them to be applied in either “I” or a “Y” formations – the two most common application techniques. 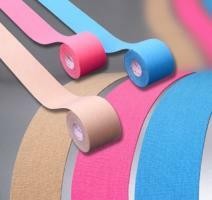 Precut strips eliminate most of the cutting that is required to apply kinesiology tape from rolls. More recently, SpiderTech introduced SpiderTech PowerStrips, precut X, Y and I strips in convenient accordion-packs. The X and Y strips are 2″ wide by 8″ long, and the I strips are 1″ wide by 6″ long. Although Kinesio® Tape and Kinesio Tex® Tape are both trademarked brand names, these terms have become to kinesiology taping what Xerox is to photocopying. Many people now use the term Kinesio Tape to refer to kinesiology tape in general, which isn’t a bad thing at all for Kinesio® sales! Common misspellings I have seen in search terms include kinesiotape, kinisiotape, and so on. Each of the manufacturers and many medical supply companies now sell kinesiology tape. Many sites, however, sell only to licensed health professionals. Theratape.com is the only website specializing in kinesiology tape and carrying a complete line of products from all 4 major brands. Theratape also provides a comprehensive Education Center with detailed information on each of the brands, plus instructional videos and printable application instructions. No registration is required to purchase from Theratape, and all educational resources are available free of charge. So begins a detailed article on kinesiology tape in today’s Wall Street Journal. Overwhelmingly positive overall, “Putting on the Stripes to Ease Pain” discusses how kinesiology tape has rapidly established itself in North America and introduces the companies that have taken it to a new level. The three major manufacturers are profiled, including Kinesio Tex Tape, SpiderTech Tape and RockTape. Each has established itself by virtue of a specific market niche – Kinesio Tex Tape as a clinical product, Spider Tech as the leader in precut kinesiology tape for different body parts, and Rock Tape as a premium performance-enhancing tape for athletes. As kinesiology taping applications are being seen on more athletes in more sports, the demand for the products at the consumer level is exploding. Many online retailers sell only to health professionals, but all three brands are available to the general public on a specialty kinesiology tape website, www.theratape.com. If the validity of kinesiology taping was ever in doubt, this profile in the Wall Street Journal has given it the official “big business” stamp of approval. The SpiderTech Tape company has created a comprehensive line of precut kinesiology tape applications for different parts of the body. Each application comes individually packaged with illustrated step-by-step instructions. These products provide a convenient and inexpensive way for non-health professionals to apply kinesiology tape effectively. This is the first in a series of blogs describing the different SpiderTech applications, their uses and how to apply them. Begin by tearing all of the perforations on the backing of the tape. Clean the skin with soap and water or rubbing alcohol before applying tape. 1. Subject should be lying on back with leg relaxed. Remove half of the backing from section 1 and apply as high as possible over the groin area. Repeat with the other half of section 1. Gently rub the tape to activate the adhesive. 2. Place the groin muscles in a stretched position by abducting the leg. Remove the backing from the top arm of section 2 and apply along the upper boundary of the groin (adductor) muscles. It is not necessary to stretch the tape as it is applied. 3. 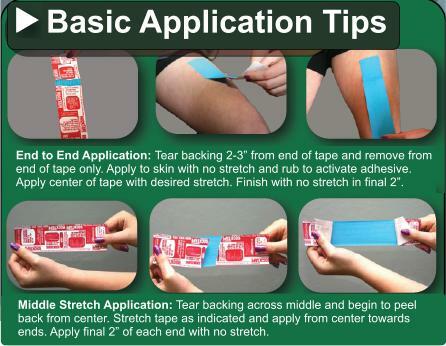 With the groin muscles still stretched, remove the paper backing from the middle arm of section 2 and apply the tape directly over the center of the injured groin area. Rub each section of tape immediately after applying to activate the glue. 4. Remove the backing from the final arm of section 2 and apply it along the lower boundary of the groin muscles with no additional stretch in the tape. Patient can now relax the leg and move freely. 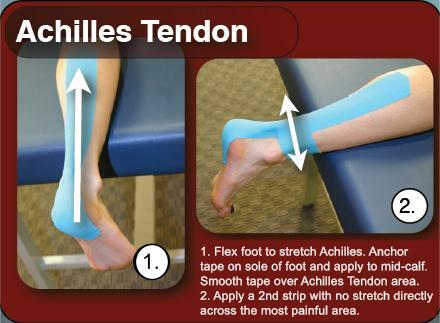 Avoid exercise or bathing for one hour after applying the precut kinesio tape to allow the adhesive to fully set. 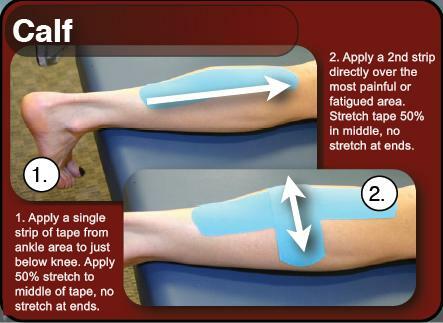 How to Apply Kinesiology Tape. My next post will include the application video for the SpiderTech Groin SpiderTape. One of the greatest features of kinesiology tape is that it can be worn for several days at a time. It continues to provide therapeutic benefits, 24/7, for the entire time it is on the body. It’s like receiving physical therapy around the clock for days at a time, for only a few dollars. With that said, however, some kinesiology tape users have experienced difficulty getting their applications to stay in place. This posting will look at the most common culprits when kinesiology tape won’t stick, and present solutions that should increase the wear time significantly. Although all kinesiology tapes may appear identical at first glance, they are not all identical when it comes to quality. Inferior brands can actually start peeling off the skin within minutes of application, making their bargain prices quickly seem not such a good deal after all. Solution: Don’t select your kinesiology tape on price alone. The top brand for “stickability” is RockTape, which has a stronger adhesive than any other kinesiology tapes. RockTape receives high praise from high level triathletes for its ability to remain in place through entire Ironman triathlons, including the ocean swims. SpiderTape is also a top quality kinesiology tape, being made from the original Nitto Denko tape from Japan. Any type of oil on the skin is the kiss of death to a kinesiology tape application. This includes oils produced naturally by the skin, as well as any topical lotions, creams, etc. The skin should be as oil-free as possible before tape is applied. Solution: Clean the skin well with soap and water and/or rubbing alcohol immediately before applying kinesiology tape. Make sure skin is completely dry before taping. Kinesiology tape will remain in place throughout swimming, showering or intense perspiration … provided the adhesive has a chance to properly activate before any of this occurs. If moisture is introduced under the tape before the adhesive has been set, the tape will begin to lift very quickly. Solution: Make sure skin is dry and oil-free before applying kinesiology tape. Immediately after applying the tape, rub it briskly (from center to ends) to activate the adhesive, then wait at least one hour before introducing any type of moisture (showering, swimming or sweating). If you have a lot of body hair in the area you’re taping, the tape is going to stick to the hair, not the skin. This has two downsides. The first is that the tape will not stick well (although the pain you experience as you remove it may make you wonder). Second, the taping won’t be as effective, since it is the direct contact between kinesiology tape and the skin’s surface that is responsible for the therapeutic benefits. Solution: Clip or shave any hairy areas before applying kinesiology tape. It will stay on longer, work better … and hurt a heck of a lot less when you remove the tape! Therapists trained in the art and science of kinesiology taping are able to create complex applications for a wide variety of injuries and health conditions. For complicated injuries or medical conditions, this level of expertise may be required, but for everyday aches and pains no special training is necessary. Most people, armed with a roll of kinesiology tape and some basic instructions, can create an application that will effectively relieve pain and reduce swelling. This part of a series of posts presenting very simple, yet effective, taping techniques that virtually anyone can master. They were developed by the makers of RockTape, a new brand of kinesiology tape that has been engineered to enhance athletic performance in addition to providing therapeutic benefits. The following series of posts will present very simple, yet effective, taping techniques that virtually anyone can master. They were developed by the makers of RockTape, a new brand of kinesiology tape that has been engineered to enhance athletic performance in addition to providing therapeutic benefits. Why is Kinesiology Tape Stretchy? One of the features that makes kinesiology tape different from other types of therapeutic tape is its elasticity. Kinesiology tape is designed to stretch up to 40% beyond its “resting” length (i.e., its length with the paper backing still applied). This “stretchability factor” greatly increases the therapeutic benefits available from kinesiology taping as opposed to traditional athletic taping techniques. This post will provide a general overview of the benefits associated with the elastic properties of kinesiology tape. The following information is equally applicable to both formats of kinesiology tape currently available: Kinesiology Tape by the Roll (brand names Kinesio Tex Tape and SpiderTape), and Pre-Cut Kinesiology Tape Applications (brand name SpiderTech Tape). When kinesiology tape is stretched as it is applied to the skin, it creates a microscopic lifting of the skin in the taped area. This relieves pressure on the local pain receptors, reducing irritation, pain and spasms. Conventional athletic tape, on the other hand, can actually increase pain in an acutely injured area as it does not accomodate to swelling or movement. This lifting action also allows for enhanced circulation of both blood and lymphatic fluid. Increased bloodflow accelerates healing by delivering more oxygen and nutrients to injured tissues, while improved lymphatic drainage reduces swelling, edema and inflammation. The elastic properties of kinesiology tape allow it to provide therapeutic benefits to an injured or painful area without the rigid compression of traditional taping. This means that kinesiology taping applications can be safely left in place for several days, as opposed to conventional athletic tape that must be removed within hours because of reduced circulation. In fact, the longer a kinesiology taping application is worn, the better, since the therapeutic benefits continue to accrue for the entire time it is worn. The elasticity of kinesiology tape makes it the preferred method of taping for injured athletes who desire to continue training and/or competing as they recover from their injuries. When applied with the appropriate amount of stretch, kinesiology tape can provide support to an injured area, preventing harmful overstretching or over-contraction, without restricting a healthy range of movement. When stretched kinesiology tape is applied to the skin, the ongoing sensory stimulation from the tape can override pain signals from an injured or inflamed area, providing a safe, non-pharmaceutical approach to pain relief. Watch for upcoming posts providing more detailed guidelines for stretching tape and muscles in kinesiology taping applications. add comment | Comments Off on Why is Kinesiology Tape Stretchy? Web strips are pieces of kinesiology tape with solid ends and 4-6 longitudinal cuts extending through the center section. 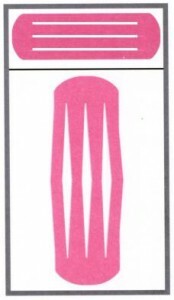 When applied to the skin, the strips are separated from each other by pulling the center of each strip away from the center of the treatment area. These complex-looking applications are designed to lift the skin above a painful, swollen area, relieving pressure on pain receptors and enhancing lymphatic drainage to reduce swelling and edema. Place the joint into a position of maximum stretch to measure the length of tape required. Cut a piece of Kinesio Tape to the desired length, then bring the ends together folding the tape in half. 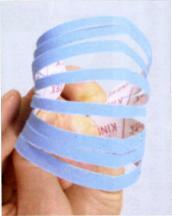 Make parallel longitudinal cuts from the fold towards the ends of the tape, leaving approximately 1” uncut at the end. 1. Place the joint to be taped into a position of maximum stretch. Apply one end of the web strip with no stretch just below the area to be treated. One at a time, remove the backing from the web strips, and apply them over the treatment area. Begin with an outside strip, stretching the center portion slightly away from the treatment area. Maintain a separation of at least 1/4″ between each strip. Finally, apply the other base end, also with no stretch in the tape. 2. Place the joint to be taped into a position of maximum stretch. Begin by tearing the paper backing in the middle of each web strip. One at a time, peel back the backing from one end of each strip and apply to the treatment area with a light stretch. Maintain a separation of at least 1/4″ between strips as they are laid down. When all strips have been applied, remove the backing from the ends and apply with no stretch.